It seemed like a good idea at the time. In fact, it was. We were off on an adventure. With a family wedding in Colorado at the end of September, we decided to use the preceding two weeks to drive out west and explore. Yellowstone and the Grand Tetons were on our list, but beyond that we had no real plan. The unique element was traveling by campervan. 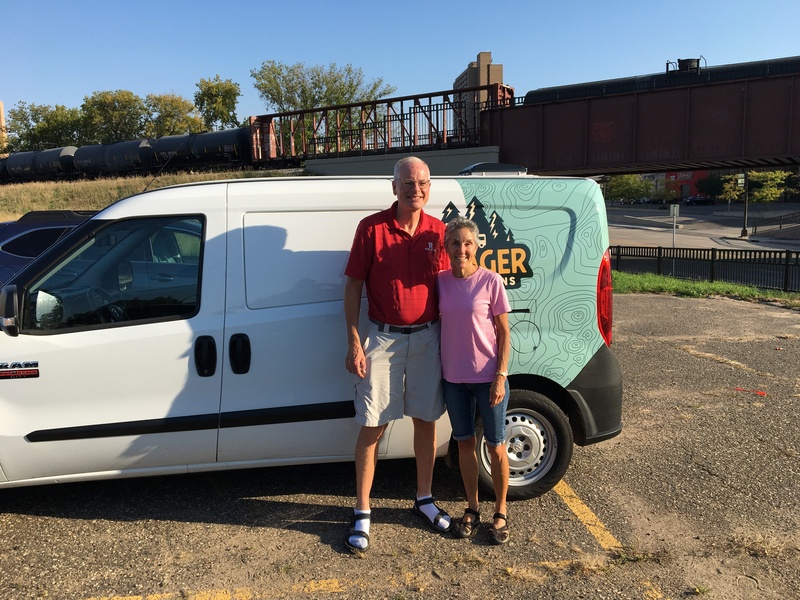 We found a small start-up company in the Twin Cities that rents mini-van sized vehicles that seat two in the front and sleep two in the back. It would keep us out of the elements and provide a soft mattress for these aging bodies. It has a slide-out with one burner for cooking, spots for a water jug and a cooler, plus storage. Perfectly bare bones. It would give us the freedom to wander at will. It seemed the perfect solution. We talked it up to all our friends. They too were intrigued. I rather liked the thought of sleeping in a tin can in bear country. An added layer of protection. Rich fancied the idea of sidling up to the fancy RVs in a Walmart parking lot one night, just for kicks. 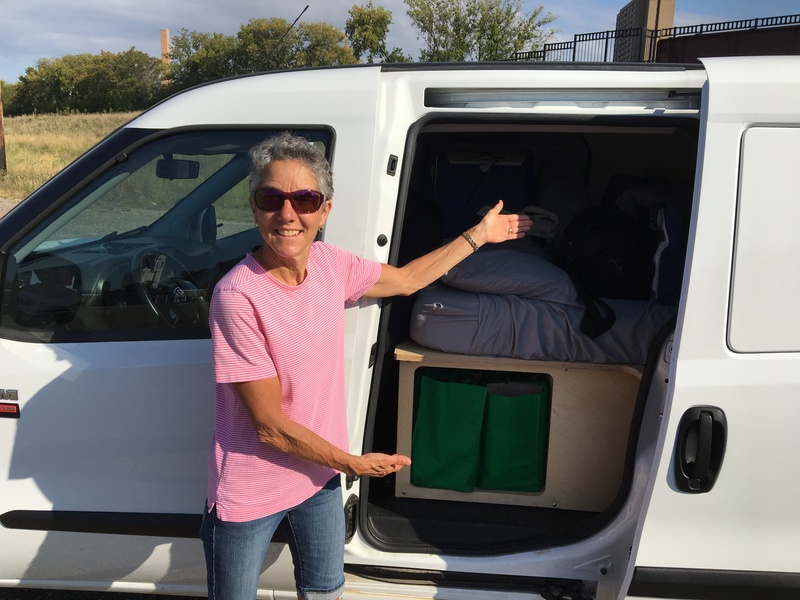 All went smoothly as we transferred bags and gear from our car to the campervan. We found space for everything – just barely – and hung our bikes on the rack in back. Giddily climbing into the front seat we set off. We were only three miles away, on the highway entrance ramp when it happened. The warning light went on and the engine heat soared into the red zone. Unwilling to drive it in that condition, we contacted the owner who arranged for his auto shop to take it right away. The 90-degree heat not only exacerbated the problem but singed our sagging spirits. Hot air blew through the open windows, cars sped by and the sun beat down relentlessly as we waited for the engine to cool. Only when it was well out of the danger zone would we putter down the road. Until it overheated again. This scenario repeated itself over and over again in the next two hours, just to get 12 miles. The auto shop discovered an improperly connected coolant hose, and no coolant remaining in the system. No wonder it overheated. The van owner was there with fervent apologies and offers to help us pass the time during the repairs. Even in our misery, we felt for him. It wasn’t his fault, he’d had the van serviced and inspected before he rented it to us. But by then it was too late. Rich was spooked. A desperate conversation took place next to the van, in the stifling heat, sweating. Could we trust the van, after this issue? What if other trouble lurked? We were heading out to remote areas, thousands of miles from home. I struggled with letting go of our plans. Dropping the new experience just like that. But I have learned a thing or two in 35 years of marriage. I could tell that Rich would never relax in that van. It was time for Plan B.
Scratch the van. Retain the adventure. 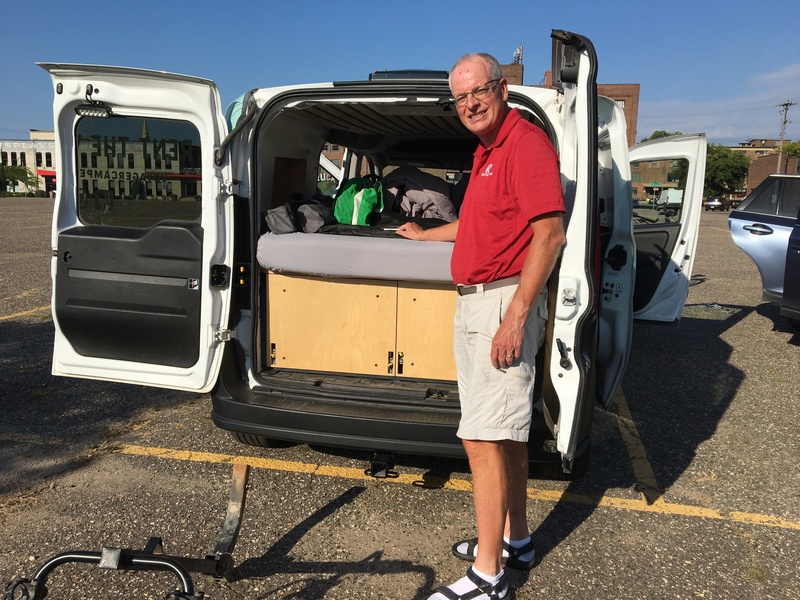 We would drive back to Duluth, pack up our tent, sleeping bags and camp stove and get a fresh start. Tomorrow.